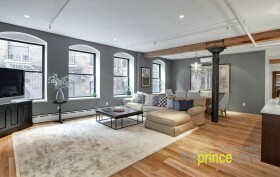 An adorable two-bedroom renovated loft, designed by Nikolai Katz, has just popped up on the market, asking $4.895 million. The 2,200-square-foot pad is basically the best of all worlds, with original details and modern updates, and a prime Noho location. There are actually a few proposed options for this flexible floor plan. Each one makes the most of the natural light provided from the home’s oversized, northern and southern-facing windows. An open living space showcases many of the loft’s original details, such as exposed brick walls, 10-foot ceilings, exposed beams and a cast-iron column. It looks like the penthouse at 221 West 13th Street had a bit of trouble selling back in 2011, which is good news for some lucky prospective renters because the beautifully decorated West Village duplex is now available, fully furnished, for $25,000 per month. We’re pretty sure there’s a saying for that: one man’s misfortune is another man’s opportunity. Apparently, the space was originally designed as two separate residences, which may have had something to do with its trouble finding a new owner… well, that and the fact that price kept increasing. 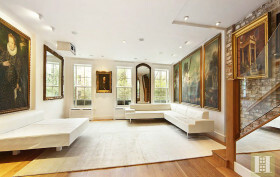 Whatever the case, this three-bedroom townhouse has quite a few surprises up its sleeve.